Why choose between your puppy's two favourites? 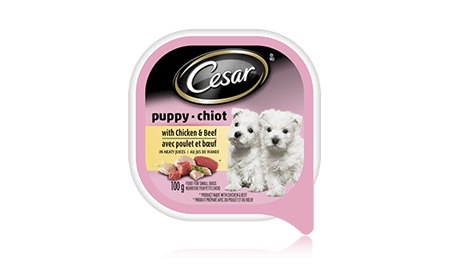 Give him CESAR® With Chicken & Beef in Meaty Juices. Specially prepared for puppies and flavoured with tender chicken and hearty beef, it's five-star dining at its best. CESAR® Puppy Canine Cuisine with Chicken & Beef in Meaty Juices is formulated to meet the nutritional levels established by the AAFCO Dog Food Nutrient Profiles for growth. MEAT BY-PRODUCT, CHICKEN, LIVER, BEEF, MINERALS & VITAMINS, CHICKEN BY-PRODUCT, FISH OIL, CARRAGEENAN, DRIED YAM, COLOUR, XANTHAN GUM, NATURAL FLAVOUR, ERYTHORBIC ACID, DL-METHIONINE, GUAR GUM, SODIUM NITRITE (FOR COLOR RETENTION), SUFFICIENT WATER FOR PROCESSING.